"It’s similar to treading water. You just got to keep doing your best to keep your head up." On paper what I’ve achieved seems pretty impressive. As a graduate of the University of Vermont with a B.A. in Biology and Nutrition & Food Sciences, a valedictorian, and a Phi Beta Kappa Member, I know that these accomplishments are nothing but great. Yet, if you looked into the years spent obtaining this degree, you may have seen that life was anything but easy. In all reality, during these years of hard work and accomplishment, I was also the girl dealing with anorexia, among other things. And that’s the point I’d like to make today, you never really know what anyone is ever going through. So on that note, here’s a bit of what life looked like in college for me. So before I get into the whole scene, there are a few things I feel worth are mentioning. I guess you could call it a quick preface of pre-college days. So imagine coming home from vacation ready for your first day of senior year of high school. You are already upset that the summer is over, and yet, there’s something else going on. Well, imagine now if your dad came into your room abruptly at 1:00 a.m. You question it, and try to make sense of it, yet as soon as you try to figure it out, he blurts out that he had an affair. You had not known. From this point out things are different. You feel split in half and even though you are taking the hardest courses, you find yourself up at 3 a.m. trying to catch up. Exhausted. Stressed. And completely overwhelmed. That’s how I felt. Now picture yourself one more time ready to go to college. The day you are driving with your mom ready to get all settled in, the divorce papers are unknowingly filed (at least for both me and my mom). Now how would you feel? So now that you know my story and how college started out, let me say this… going to college is hard. But you know what is harder, going to college with anorexia or any type of mental illness. In all reality, it’s similar to treading water. You just got to keep doing your best to keep your head up. For me, the hardest part was trying to balance out my school work with socializing with friends. I had so much going on at the time at home, was taking challenging courses, and also terrified of many of the foods that were served at dining halls. Long and behold, I ended up buying salads or making something from the confines from my dorm room. It worked, I guess, but ultimately, it wasn’t your typical college experience. And that’s my point. Going to college with any mental illness is hard. There are a lot of obstacles that you need to face that seem hard, let alone impossible at times. 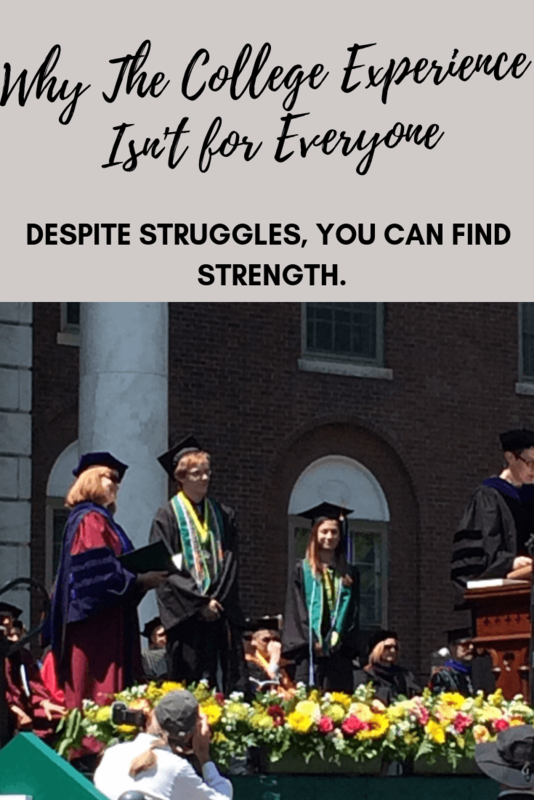 It can be hard to balance everything all at once, and oftentimes you may find yourself looking at others wondering how the college experience is possible. Yet what I’ve found many times to be true is that each and everyone of us has struggles. While they are all different, they are pretty much the same, in the fact that they hurt. Oftentimes that girl or guy you are looking at that seems happy, is not. And in all reality, they are doing the same to you, as they don’t know what you are struggling with or what struggles you’ve come from. So I don’t want to go into all the details right now, but if I were to tell you more of what I went through you may be surprised. For years and years after this one little uncomfortable situation there were many more to come. From having a little surprise on the first semester home (aka meeting my mom’s new live-in boyfriend who was 99 percent of the time drunk and unemployed… another story) to having to face my battle with anorexia, there were many things on my mind. And many more struggles to come. But the point of this is that even despite these battles and two medical leaves, I did what I wanted to do. I passed with flying colors and got one of two awards. In spite of struggling with mental disease, I had gotten my degree — and given all that I struggled through, it meant more. So, my point is not to complain nor to just talk about my experience. It’s about breaking down the barriers that we commonly see with mental health, inspiring others to never give hope of what can be, and also to share my story to show that no matter what your past or present is, you can do whatever you’d like. It will be hard and it may take a bit longer. But I believe in you even when you don’t believe in yourself. BA in Biology and Nutrition. Sister of a Type 1 Diabetic and Food-Allergy Sufferer. Survivor of Abuse and 10 year battle with Anorexia. Passionate about all things related to health.